Mahmoodian, V., Makui, A., Gholamian, M. (2015). A new mathematical model for intensity matrix decomposition using multileaf collimator. Journal of Industrial and Systems Engineering, 8(2), 13-29. Vahid Mahmoodian; ahmad Makui; Mohammad Reza Gholamian. "A new mathematical model for intensity matrix decomposition using multileaf collimator". 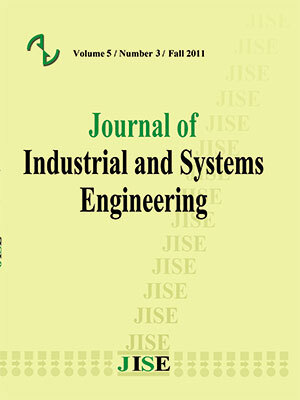 Journal of Industrial and Systems Engineering, 8, 2, 2015, 13-29. Mahmoodian, V., Makui, A., Gholamian, M. (2015). 'A new mathematical model for intensity matrix decomposition using multileaf collimator', Journal of Industrial and Systems Engineering, 8(2), pp. 13-29. Mahmoodian, V., Makui, A., Gholamian, M. A new mathematical model for intensity matrix decomposition using multileaf collimator. Journal of Industrial and Systems Engineering, 2015; 8(2): 13-29. Cancer is one of the major causes of death all over the globe and radiotherapy is considered one of its most effective treatment methods. Designing a radiotherapy treatment plan was done entirely manually in the past. RecentlyIntensity Modulated Radiation Therapy (IMRT) was introduced as a new technology with advanced medical equipmentin the recent years. IMRT provides the opportunity to deliver complex dose distributions to cancer cells while sparing the vital tissues and cells from the harmful effects of the radiations. Designing an IMRT treatment plan is a very complex matter due to the numerous calculations and parameters which must be decided for. Such treatment plan is designed in three separate phases: 1) selecting the number and the angle of the beams 2) extracting the intensity matrix or the corresponding dose map of each beam and 3) realizing each intensity matrix. The third phase has been studied in this research and a nonlinear mathematical model has been proposed for multileaf collimators. The proposed model has been linearized through two methods and an algorithm has been developed on its basis in order to solve the model with cardinality objective function. Obtained results are then compared with similar studies in the literature which reveals the capability of proposed method. unconstrained multileaf collimator problems in cancer radiation therapy,. Networks, 45, 36-41. Constraint Programming for Combinatorial Optimization Problems. Springer. and multileaf collimator sequencing., Discrete Applied Mathematics, 152, 6-34. Computational Management Science, 2, 3-19.
treatment using multileaf collimators, Networks, 43, 226-240.
collimator sequencing problem., Discrete Applied Mathematics, 160, 81-99.
integer sets, Information Processing Letters, 101, 129-133.
modulated radiation therapy. 4OR, 6, 199-262. Journal on Computing, 2, 61-63. Meyer, J. L., Verhey, L., Pia, L. & Wong, J., (2006), IMRT· IGRT· SBRT. supply chain, Transportation Research Part E: Logistics and Transportation Review, 67, 14-38.
and techniques, Springer Publishing Company, Incorporated. paradigm, International Journal of Radiation Oncology* Biology* Physics, 43, 671-680.
using rectangular apertures, Computers & Operations Research, 40, 2178-2186.
sequencing in IMRT treatment planning, Operations Research, 58, 674-690.